AthTek IP - MAC Scanner is the world leading tool for network management and network analysis. This famous tool is designed for both network administrators in the office and LAN users at home. AthTek IP - MAC Scanner keeps your networks under security control. AthTek IP - MAC Scanner provides IP scanner and MAC scanner to help you get the connection details freely. It also provides a ping tool for testing the access to network. The scanned IP or MAC can be analyzed by AthTek IP - MAC Scanner, to track the illegal users. Remote control functions enable you to wake up, shutdown and send messages to another computer on LAN. Built-in email sender sends log email to you automatically. 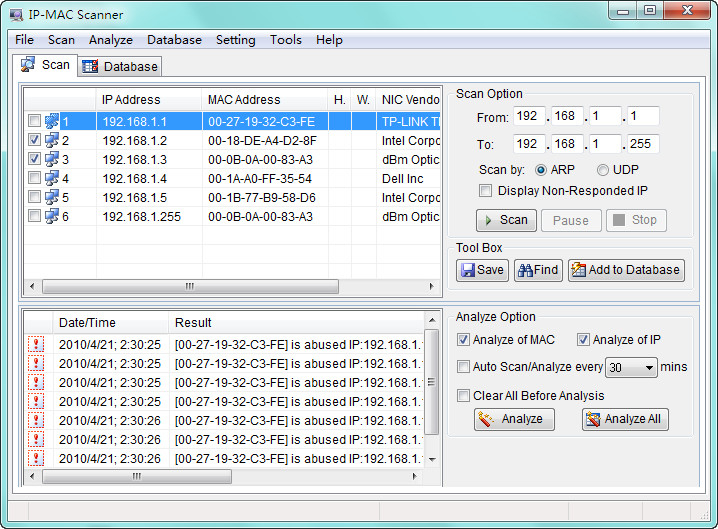 Get a fast view of AthTek IP - MAC Scanner: * Scan IP Fast and accurate scanning IP on LAN by ARP or UDP. * Scan MAC Display all the connected MAC of computers. * Ping test Test the access of selected IP in database records. * Remote Control Enable to wake up, shutdown and send messages to another computer on LAN. * Log Email Sending Method Built-in email sender enables to send log email to you automatically. * Fast, it's really fast! Multithreading scanner let the scanning process is more than three times faster than our competitors. * Information display Besides IP and MAC content, you can also see the hostname, workgroup, even the name of adapter cards. * Analyze scanned addresses Intelligent analyzing the scanning results to track illegal accesses to network, including DHCP clients. * Data backup and restore Enable to backup and restore the scanning results, support .xls and .bat (ARP) * Easily handle powerful functions Even junior user can handle senior functions. Scrutinizer NetFlow sFlow Analyzer uses Cisco NetFlow technology and the sFlow standard to provide incredibly detailed network utilization information for the hosts and applications causing the most traffic. This site does not contain serial number, crack, keygen AthTek IP - MAC Scanner serial number : serial number is the simplest type of crack. A serial number(cdkey,product key,etc) is register the program as you may already know. a crack or keygen may contain harmful software. If you cannot find the exact version you want, just give it a try. for more information read .nfo/.txt/.diz file include in zipped file.